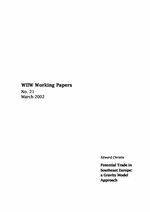 This paper estimates a classical gravity model for trade on aggregate trade volumes between OECD and transition countries. The results are used to analyse and make projections on trade flows into and out of Southeast European countries following scenarios on potential GDP levels and possible membership of institutions. Alternative variables are also tested, namely transport times instead of geographical distance, and GDP in PPP instead of nominal. Replacing distance with transport times does not lead to great improvements in the model's performance. The use of GDP at PPP is presented mainly to try to deal with specific situations where local prices prevail. The striking feature that emerges in Southeast Europe is of flows of extreme values, in some cases far below, but in others far above, what classical gravity model estimates show. The main conclusion is that Southeast Europe can no longer be viewed as a region from the point of view of aggregate trade flows.